Sorry for bumping, but: Where could I find it then? I've downloaded the binaries from Your site, but the end-text is annoying. I'd like to remove it. As you may know that Sakhr MSX1/MSX2 series has an Arabic/English or French wordprocessor which can be accessed from the Arabic firmware's main menu. Sakhr MSX2 wordprocessor is already dumped as a single file. 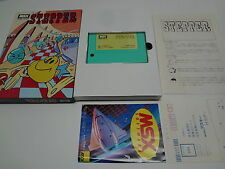 How can I make Sakhr MSX2 wordprocessor executes just like it was a cartridge ROM?! So other non Arabic MSX2 can execute it at least without arabic support! How can I extract only the Sakhr MSX1 wordprocessor alone to a single file and execute it just as if it was a cartridge ROM?! So other non Arabic MSX2 can execute it at least without arabic support! For benefit MSX users with other softwares which are built-in Sakhr MSX1/MSX2 firmwares. Who can make the Sakhr MSX2 (Painter, calendar, Sakhr Files, Sakhr Logo, etc.) program runable as an external normal cartridge.